Enjoy beach and seashore theme educational activities for preschool and kindergarten. You will find free crafts projects, printable activities and coloring pages with easy to follow lesson plans, and related resources. 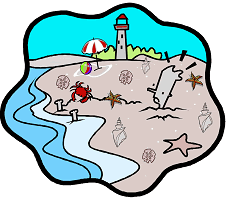 Sandy Beach Scene: count seashore creatures, beach/seashore objects and color. For the summer use watercolors and/or colored sand to decorate images. Print beach & ocean theme images on light blue paper for a sky and/or ocean water background. Explore the Coral Reef: Fun online activity to identify fish, jellyfish, starfish, sea urchins, lobsters, a shark, a sea turtle, and more.